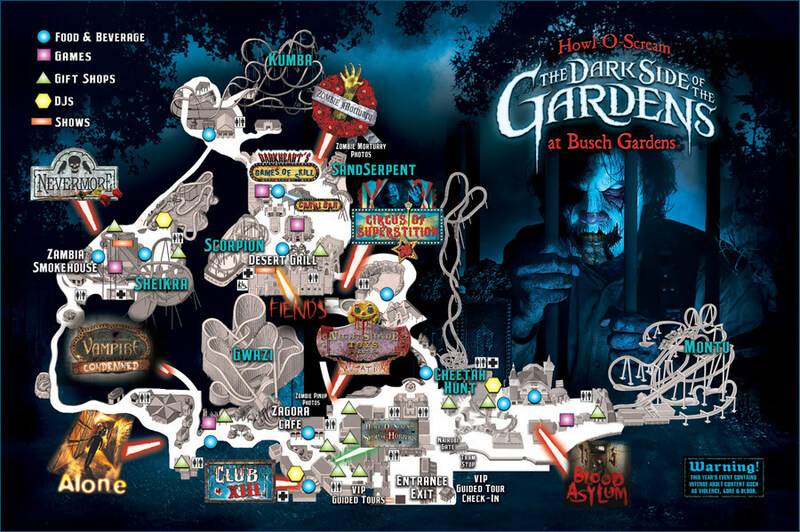 The 13th year of Florida’s top-rated Halloween event saw the return of the main theme, The Dark Side of the Gardens, with a new tagline “Unlock the Fear Inside.” Trickster was Howl-O-Scream 2012’s icon. There were a total of seven haunted houses, with two new ones and the return of the upcharge Alone experience in that number. The popular Fiends show returned, and two new entertainment offerings joined the line up. Details for Howl-O-Scream 2012 were first announced on August 15, 2012. This fall, Howl-O-Scream 2012 lures unsuspecting victims to explore the terror that grows behind the Dark Side of the Gardens’ gate and “Unlock the Fear Inside.” As Florida’s top-rated Halloween event celebrates its unlucky 13th year, it just may be your own curiosity that seals your fate! Busch Gardens’ 335 acres will be overgrown with dark, sinister, adult-targeted fun, including new haunted houses, scare zones, thrilling live stage shows and the chance to ride adrenaline-fueled coasters in the dark, including Florida’s first triple-launch coaster, Cheetah Hunt. Even the streets themselves aren’t safe as insatiable hoards of devious creatures pour forth from the shadows, led by a terrifying Trickster who is scheming to show fans the most horrifying Howl-O-Scream ever. It will leave you begging for mercy… and screaming for more. Alone… (A personal experience in horror) – The deranged Master Alexander Daedalus opened Minotaur Storage to house his vast collection of “cultural” remains. But now his sinister obsession with hoarding has expanded to stockpiling people. Escape this lunatic’s labyrinth or you will become part of his collection. Can you make it out ALONE?Note: Alone is a unique, all-alone experience through the haunted house for an additional fee. Reservations are required, and each reservation can accommodate you and up to 3 additional victims. Pass member discount does not apply. Not included with any other VIP tour or upgrade product. Howl-O-Scream admission is required, but not included. Faded Memories – Thirteen years of horror-filled memories come swarming back as the most sinister icons, diabolical characters and disturbing scenes from your favorite Howl-O-Scream haunted houses and scare zones from the past converge to create the ultimate “best of” scrapbook of scares. After braving bone-chilling coasters in the dark such as Cheetah Hunt, SheiKra, Montu, Gwazi and Kumba, you can catch your breath at Howl-O-Scream’s signature show, Fiends. NEW! Slip of the Tongue: A Demonstration of Dark Magic – Your mind might play tricks on you as Travis and his silent-but-sultry partner Jasmine conjure up a creepy combination of mindreading, sideshow freakiness and “don’t try this at home” danger in Nairobi Plaza. NEW! The Awakening – This modern restaging of a fan favorite from Howl-O-Scream’s past “revamps” the bloodsucking story of the transformation from human to vampire through contemporary music and dance, with performances in Stanleyville Plaza and Jungala. CLUB XIII – Escape the hordes and head to the transformed Marrakesh Theater to drive yourself mad partying at Howl-O-Scream’s exclusive dance club. This adults-only nighttime playground keeps the energy pumping all night long with non-stop music, premium signature cocktails, drink specials and exclusive appearances by Howl-O-Scream’s most terrifying personalities. Howl-O-Scream Shop of Horrors – Remember your evening of undead excitement with a Tricky trinket that’s not for the faint of heart. General admission is $79.99 plus tax. Reduced advance-purchase rates and special offers are available for Busch Gardens pass members at TheDarkSideOfTheGardens.com. Savings on general admission tickets are available in advance at participating Publix Supermarkets or with promotional codes found at participating Taco Bell and Applebee’s locations in Central Florida. Take advantage of the best way to see Howl-O-Scream with all-inclusive VIP Packages, which include event admission, a tour guide and your choice of three levels of terrifying special treatment: The Super experience is a three-hour group tour of haunted houses that includes front-of-the-line access. The five-hour Mega experience adds reserved show seating, front-of-the-line access to several roller coasters and preferred parking, and the Ultimate experience adds the Fright Feast dinner buffet, meet and greet with the Howl-O-Scream creative team and a $5 games card. All tours include commemorative photos, merchandise discounts and complimentary beverages. Packages start at $81, and pass member discounts are available. For out-of-town guests, Wicked Weekend Vacation Packages include Howl-O-Scream admission for two, plus one-night accommodations at one of Busch Gardens’ preferred partner hotels. Prices start at $89 per adult, tax inclusive, based on double occupancy. Stay two nights as part of the Thrills and Chills Weekend Package, and get in to Busch Gardens day and night, and enjoy two nights of accommodations. Prices start at $175 per adult, tax inclusive. And if there’s one thing worse than being terrified, it’s being terrified on an empty stomach. Fright Feast is the most deranged dinner show in town, featuring a buffet of monstrous main courses and devilish desserts, plus an exclusive performance of Fiends. Fright Feast guests are also the first to brave the dark with a half-hour of early access to the all-new haunted houses and front-of-line privileges until 8:30 p.m. Fright Feast is $26 per person, with group rates and discounts for pass and Fun Card members available. Howl-O-Scream is a separate ticketed night event. No costumes are allowed. Club XIII was 18 and up only. There were two specialty drinks available at any of the full bar locations during the event. Superstition XIII: Specially blended flavors of Vodka, Orange, Lemonade, Cherry and Ginger Ale and Trickster! features Three Olives “Loopy” Vodka, mixed with CranGrape and Lime. Promotional codes available from Taco Bell, Applebee’s or from specially marked Fanta products at participating Walgreen’s for $35 off the gate price of a single night admission. First year for Fright Feast, and after 12 years of being in the Stanleyville Theater, this was the first year for Fiends to be performed in Desert Grill, with the first show of the night exclusive for Fright Feast ticket holders. A VIP Party was held on opening night for Yelp Tampa Bay Elite members, replacing the tweetup (or “bleedup”) offering that occurred in previous years. The event would end up being voted the Best Yelp Event of 2012 by elite members. Additional images and details on Howl-O-Scream 2012 will be added in the future.